DSC_0089, originally uploaded by michael_jecks. And this was the other thing I saw. 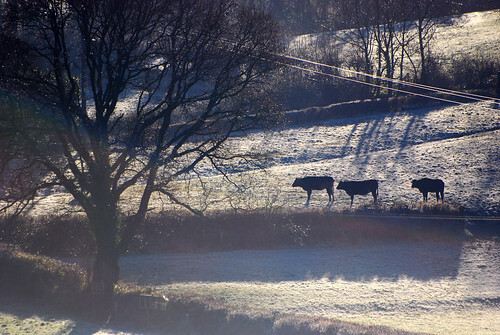 Just a line of cows standing and trying to warm their blood in the cold morning light. But I liked their posture, the power lines over them, parallel with the hedge. It appealed as a scene. And I started thinking about my next book at the same time. Book 26 will be later in the year, I reckon, and I wondered whether the cattle would have stood like that in a cold morning, their breath feathering in the air. I’ll probably have to use that thought! This entry was posted on Thursday, December 13th, 2007 at 12:20 am	and is filed under Dartmoor. You can follow any responses to this entry through the RSS 2.0 feed. Both comments and pings are currently closed.